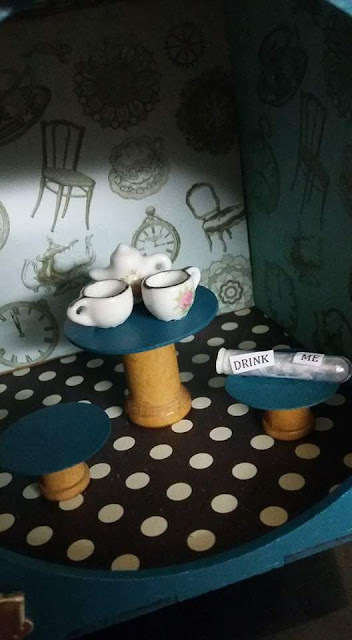 I still love the Alice In Wonderland sets from Visible Image, but the Queen of Hearts has always been my favourite. 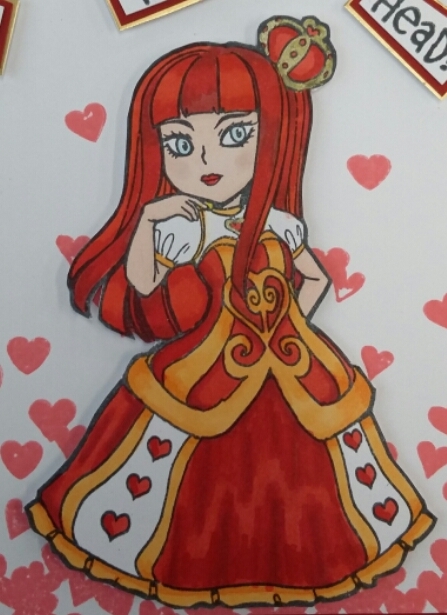 I coloured her using Promarkers and a gold pen to highlight the crown and jar lid. 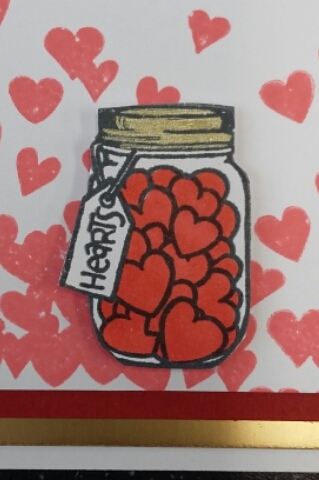 I mounted pieces of gold, red and white card with red hearts on to a 6x6 card blank. 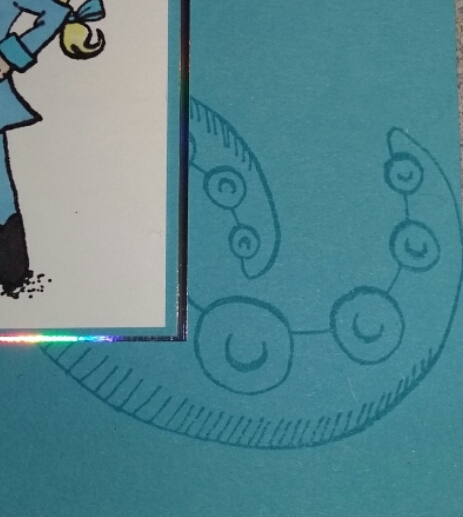 I fussy cut both the Queen and the jar, then stuck them to the front of the card. 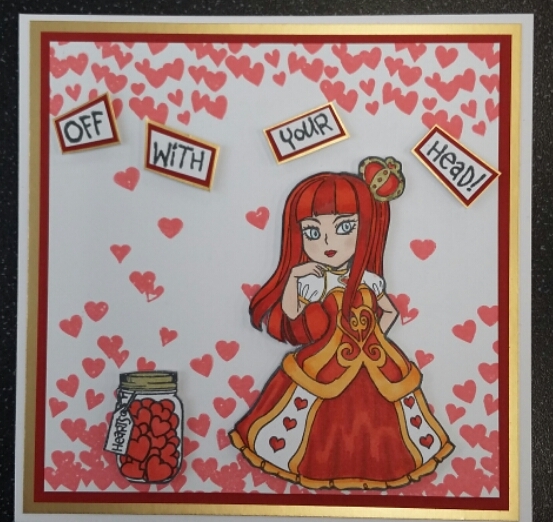 Finally I stamped the words from the set onto white card, cut them in odd shapes, then mounted them onto red and gold card before sticking them to the top of the finished card. 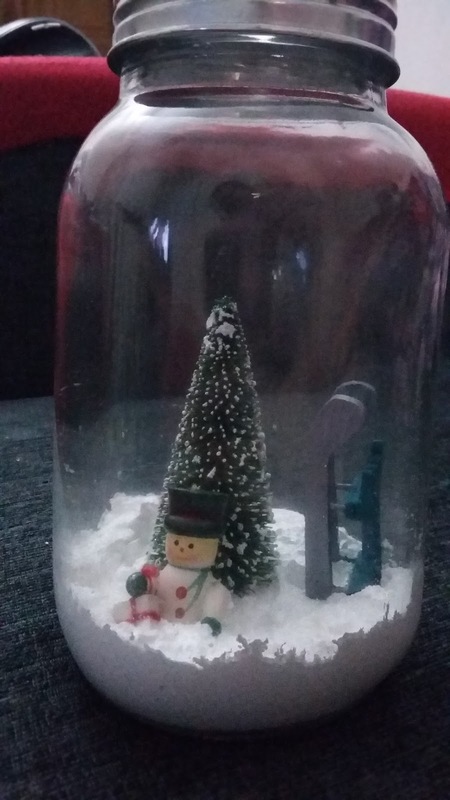 This jar was originally a tea light holder, it's glass and has a metal screw lid with a star shape cut out of it. It had a wire 'swing' connected to the lid with a tea light holder on it, I took this out before I started. The first thing I needed to do was paint the little sledge and set it aside to dry. Then I filled the base with white modeling paste, which was a task and a half, being thick it didn't exactly run off the spoon. While the paste was still wet I had to push the sledge, tree and snowman into it, then sprinkled glitter over everything. I love creating art with Lavinia Stamps, Tracey Dutton produces some amazing stamps that make cardmaking fun and easy. 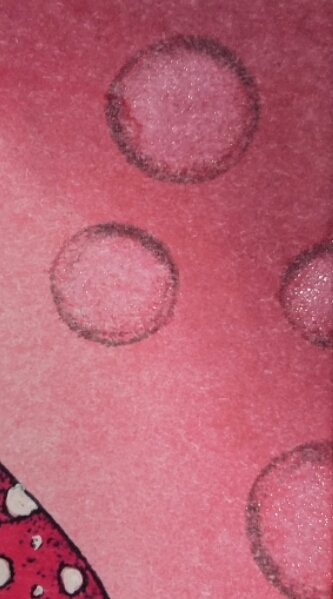 I started by inking the background card, I used several shades of pink Distress Inks. 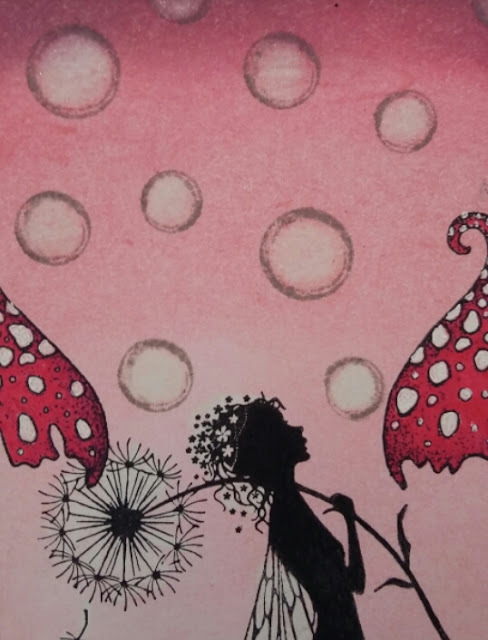 I then used grey ink to stamp the Fairy Buttercups and the Ink Caps, this gave the illusion of a misty background. 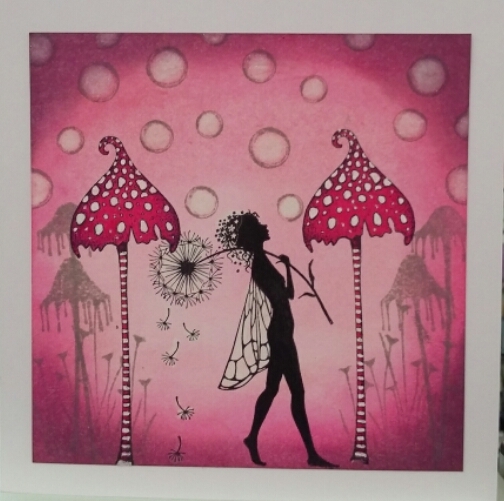 Next I stamped the fairy (Make a wish), the bubbles and the Spotty Toadstools. I added Spectrum Noir Sparkle pen in clear to the fairy, the dandelion and the bubbles. Finally I coloured the Spotty Toadstools using Promarkers and a white gel pen to give the card a bit of a pop. The strange thing was after I had finished the card I took a few pictures (three of which I have used here), I took the first picture about 24 hours later because I noticed the change in the sections painted with the Sparkle pen, almost like bleaching. This adorable stamp is Little Pirate designed by Samantha Rawlings and originally available from Sweet Pea Stamps, who have sadly closed up shop. 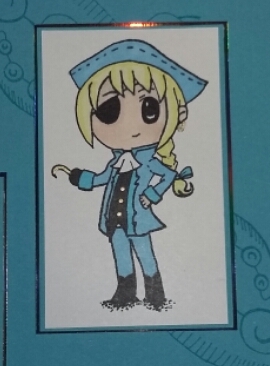 I stamped the image onto white card, coloured her in using Promarkers, then mounted the image onto a piece of blue card and a piece of silver card. 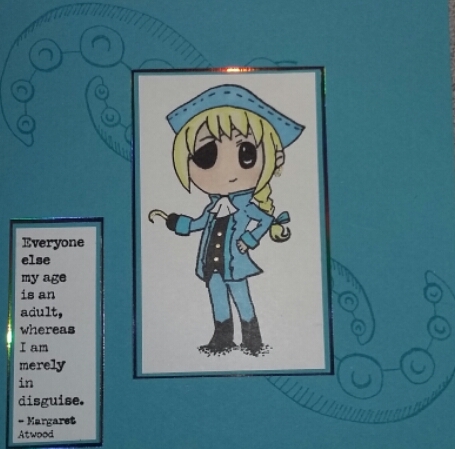 I cut a piece of the same blue card to use as the background and used Versamark ink to leave the watermark tentacles on either side of the image. I just couldn't resist the quote from Margaret Atwood as this card was for my Mum, she might be a Granny but she's not an adult. I know this may seem a bit late but I totally forgot to post this box, which was actually a Christmas present for a friend who I work with. 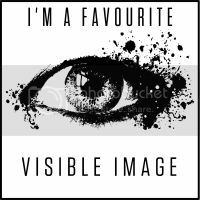 She is a very talented artist and is really making a name for herself in the crafting world, including getting her work onto the television as a designer for Visible Image. This is an Artist Trading Block and is another piece from the brilliant Calico Craft Parts it measures 4" square.The first thing I need to do was glue together the bottom and three side pieces, I couldn't attach the front and top because I needed to get my hand in to glue everything inside. 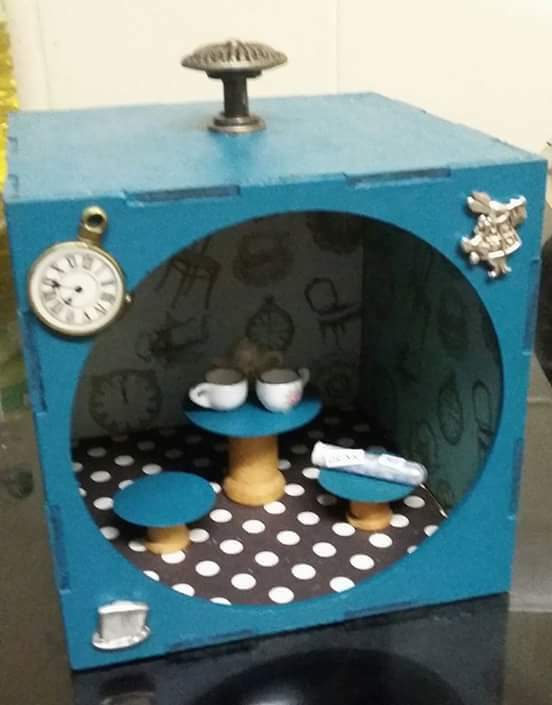 I painted the outside of the box using Turquoise Dylusions paint before lining the inside using Graphic 45 Halloween in Wonderland papers. I used three cotton spools and circles of card to create the table and chairs, adding cups, a teapot and a potion vial to the 'Tea Party' scene. I attached the front and top, then added the drawer hand onto the top and the charms on the front. I love the combination of these stamps, the mermaid is from the now closed Sweet Pea stamps and was designed by Elaine Cox. The net behind the mermaid is a Kaisercrafts stamp and the mermaid tails in the background is a Stamp Press stamp. The first thing I had to do was create the background for the net so it had time to dry off before I stamped onto it, I used the shaving foam and ink method, after a few minutes it was safe enough to stamp the net in a mid green ink. 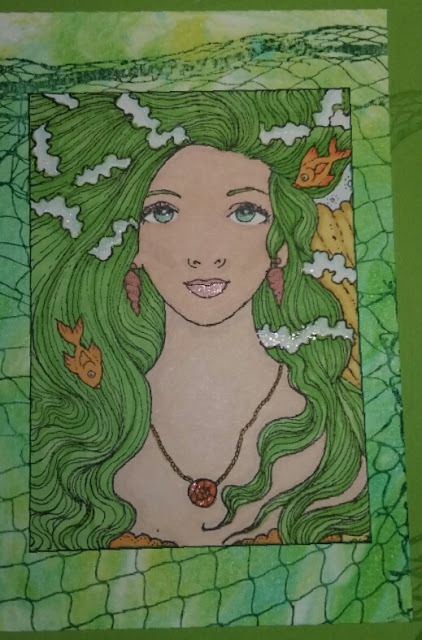 Next I stamped the mermaid onto a piece of white A7 card and coloured the image using Promarkers in various colours, finally adding a touch of shimmer using a clear Spectrum Noir Sparkle pen. 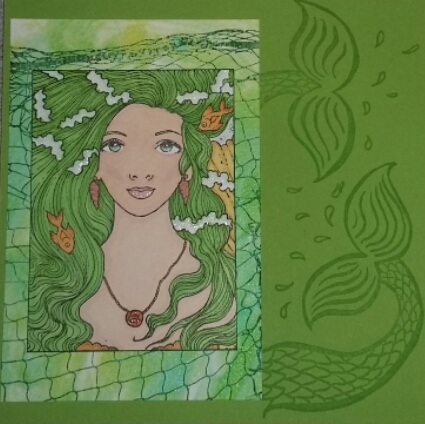 Finally I stamped the mermaid tails onto a piece of 6x6 green card using versamark ink to give it the watermark finish. 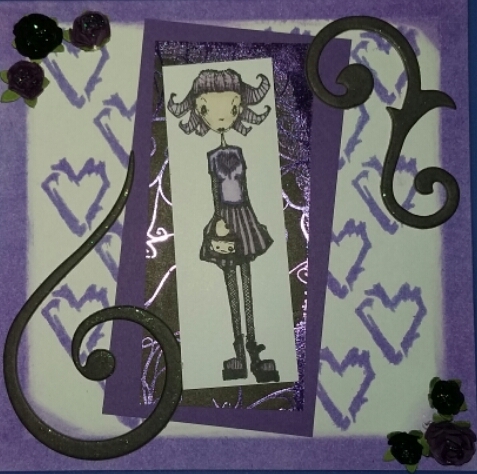 This is a birthday card for my beautiful niece Hannah, she's a typical moody teen so likes black and purple, and I thought this Stampotique stamp suited her. 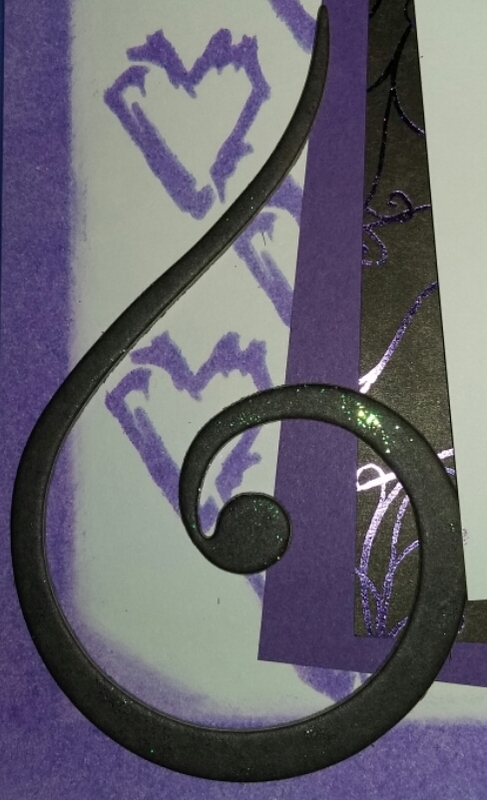 So the first thing I did was stamp the image onto a piece of white card and colour it in, I then cut a piece of purple/black print paper and a piece of purple card cutting them each slightly larger than the first. Next I used a mask to create the heart background on a 6x6 white card and added a rough border in the same ink. I started putting the card together adding two Bo Bunny thick card flourishes, brushing a little stickles onto each one, then I added three glittered black flowers to two corners. I was desperate to get my hands on this gorgeous dragonfly stamp (Live In The Moment) from Visible Image, so when I won the monthly challenge it was the first thing that went into the basket. 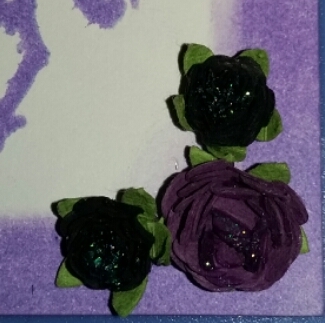 I started with a piece of 5.5" white card, I used the free mini grunge flower stamp from Craft Stamper (also design by Visible Image) to create the perfect background. I used a pale green ink to give a subtle flowery finish. 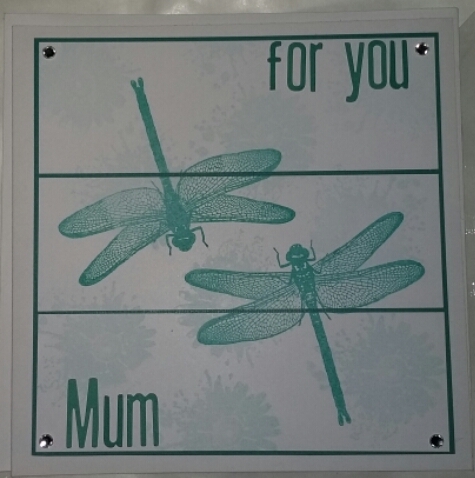 I then used a much darker ink to stamp two dragonflies traveling in opposite directions. I then cut the cut the card into three equal pieces and mounted them onto a slightly larger piece of green card, I then mounted those onto a 6x6 white card blank. Finally I added a silver gem onto each outer corner and using Thickers stickers I wrote the words 'For You Mum'.